can the pork chops be frozen? Excited to try this tomorrow. Did you use thin or thick cut pork chops? THIS recipe was my favorite so far! I did use the chicken broth instead of plain water. After browning the pork, I placed them on the rack to cook. I just wanted to see how the texture of the meat would come out doing it that way (I am still learning), and I was very happy. I made a rice pilaf for a side and I spooned the sauce over that as well. Yum! So fast and easy — I will definitely be making this one again! Can they be made with a little less butter? I made this last week with essentially frozen, bone in pork chops. It was so quick and easy. I should have doubled the ranch seasoning because I had double the pork chops but it was still a winner with my hubby and son. Thanks! Love this recipe!! If I wanted to double it, would I need to add additional cooking time? I would just add a few minutes. Probably 2 to 3 minutes and you are good. 1st IP recipe – swapped beef broth for water. Everything else same – added 4 min to cook time b/c chops were “thick” cut. Made gravy from water/cornstarch and liquids remaining from IP after chops cooked. YUM. We love this recipe. I usually use some corn starch and make a gravy with it and then make some rice. I like it with the potatoes better but my husband really likes it with the rice. THANK YOU! Many Instant Pot recipes “out there” seem to over cook everything. I appreciate the effort you made to get this one just right! Taking your lead, I adjusted the pressure cook time to 4 minutes because I had only two 1.5″ thick, 1.38 lbs. boneless center cut pork chops. I made my own dry ranch seasoning to control the salt. I pre-seasoned both sides of the chops with half of the seasoning and let them rest in the refrigerator for about 4 hours. Browned the chops and put them on top of 3 medium sized redskin potatoes halved, 4 full size carrots cut into thirds, a couple stalks of celery and the rest of the ranch. I used water. The resulting broth that developed will go into a copy-cat Zuppa Tuscana from Olive Garden I am making tonight. How much more time should I add if the chops are frozen? Made this this evening. My husband is a picky eater, but he enjoyed this!! What would you set it at if they are frozen pork chops? Do you put the pork chops in frozen? Sorry for the silly question but I just ordered one and looking for something to make they day it delivers. ? What is the thickness of the pork chops – the ones I get at COSTCO are really THICK…Thanks! Can’t wait to try this recipe. Mine are about 1/2 inch think. If yours are thicker I would just add 2 minutes to the pressure just to be safe. I accidentally got bone in chops and they were about an inch thick so I added About 3 minutes and put carrots under them. They are cooking as we speak and smell amazing. Thanks for the recipe! Can these be frozen first or should they be thawed? ingredients and time for the mini? Hi, just came across this recipe and it sounds delicious. A little too much butter for my liking though. Any suggestions on making it a little healthier? Thanks! Would chicken work in this recipe instead? If so, what cooking times would you recommend? Thanks! While my pork chops were cooking, I boiled some pasta and steamed some green beans. They all finished about the same time, so nothing got cold. I poured the leftover butter sauce over the noodles and just a little on the green beans. My 6-year old had finished her noodles before I even made it to the table with my plate. She agreed the meat was good, too. I was worried that the ranch flavor would be over-powering, but it was not. Super fast, super easy, and 6-year-old-approved! The pork chops very tender as were the diced potatoes and carrots. I know the water is necessary for the pot reaching pressure but it didn’t seem like a sauce to serve over the chops but was more watery and soup-like. Since I only used two large, thin chops I only used half of a package of the ranch dressing mix. Would a whole package have made it Thicker? Would an Italian dressing season packet work? My hubby isn’t a big ranch fan. Well it’s time to take it out if the box!! Hubby got me one for Christmas ??? Can you use frozen chops? Can I follow this recipe for 3 thick pork chops? Are pork chops frozen, or do they need to be thawed out? Do the pork chops need to be thawed out first? Trying this recipe tonight, with the super thick cut top loin boneless chops from Costco. Going to add 3 minutes to the cook time and some potatoes and carrots … hope it goes well ?. if your pork chops are frozen do you add more time? Amazing chops juicy not dry I would make this again. And fast. Are they ok to be frozen pork chops? Disregard my question. I see on the printout version it says one cup of water. Jason I just fixed it. Yes, I would increase the cook time to 10 minutes on high pressure. thanks! You could do Italian Seasoning. Hi! For those who did the redskin potatoes, did you add more water and what was the total time? Thanks! Is the sauce supposed to be like a thicker sauce? I did 5 mins high pressure and 5 min NPR, then manually released, and even let it sit for another 3-4 mins waiting for the rest of the food and its watery… not like a sauce at all…?? I have the Farberware 7 in 1 pressure cooker and I am going to try this in a little while. When you say increase the pressure to 10 minutes, do you mean let it NR for 10 minutes or the cook time to 10 minutes for bone in pork chops? Thanks! Made this tonight, it was delish! There in a chicken breast as the pork chops I had were small, cut up some potatoe, used vegetable stock. Fabulous, hubby loved it! I don’t have an Instant Pot just yet. Would you have any suggestions for adapting this to cooking in a Crock Pot? Glad I found this, best pork chops I’ve tasted, thank you for sharing ? This was delicious and has become my favorite way to prep pork chops. Even cut them up after and added to my hot and sour soup. Thank you for sharing this! This was my first Instant pot attempt after Christmas!! Family loved it so much, it’s on the menu tonight. Adding small peeled russet potatoes (bc they were getting old lol) Thank you! This sounds good and want to make tonight. Is there a substitute for the stick of butter? I think one cup of water was way too much. Mine didn’t make a “buttery sauce,” it was more like a watery mess. We made this last night. The flavor was amazing. We let the broth cook down so that it made a light gravy and spooned it over both the chops and a southwestern frozen veggie mix. So yummy. Thanks for sharing this recipe!! Amazing,they were not dry. Although I will decrease the broth or water just a bit. Family loved them. So you can do frozen pork chops? Just add additional 10 minutes——- did I read that right? I made this tonight and it was fantastic. I substituted italian seasoning for the ranch and added potatoes and a bag of frozen veggies. The pork chops were fork tender, the potatoes almost dissolved in your mouth. The seasoning made the veggies superb. My wife told me I had to make this one again. Would you add more water for more chops? How long should I cook only 2 boneless pork chops? I’m new to instant pot, what is manual? I don’t have a manual button on my pot. Also, what does quick release mean? I wish I had someone to show me! I’m more of a watch and do person! I only have bone in pork chops. Would that increase the cooking time? Would it be ok if the pork chops weren’t boneless? I found this recipe to be delightful. My wife and I really enjoyed it. This was quick and easy on a Wednesday night, pork chops where delicious and very tender.I added frozen vegetables and cut up white potatoes in 1/8 slices. I highly recommend this recipe and we’ll be cooking it again. How many ounces do I need of the dried ranch mix? Yes, I would raise the cooking time. I have added it to the post now. Hi I making frozen 1 inch thick porkchops how long total cook time? I’m making 6 1” frozen pork chops. How long total cook time? 4 1/2″ pork chops not as tender as I hoped. Next time I will add two minutes. The flavor is amazing. I chopped up 2 carrots I had and served over rice with sauce. If I only use 3 boneless chops, would I have to reduce cooking time? Thanks for the recipe! If I need 8-10 pork chops, do I double all ingredients and add time? Love this!! I substituted Italian Dressing packet instead. Thank you!! How many minutes do you brown them on each side for? I’d love to try this with baby potatoes. How many should I add and would I need to cut them up or add time and liquid? This sounds amazing & will be my first Instant Pot attempt! Wondering what I could substitute for coconut oil? Has anyone deleted the butter? Yes, has anybody tried doing these without an entire stick of butter? You can just use vegetable oil if you would like. This was great. I added potatoes and carrots and upped the time to 10 minutes with a 5 min natural release. It was AMAZING. Plus thickened the drippins/liquid for sauce. I plan on making 8-10 pork chops, do I need to double all the ingredients as well as the time? Hi there- would fresh carrots get too mushy? I could cut them in big chunks? Thank you! This sounds absolutely delicious, and will be making this week. If I add vegetables, should I sprinkle the ranch on top of everything, or put it on the chops before adding veggies? These were the best pork chops ever. Totally loved them!!!!! Anyone do this recipe with frozen pork chops? I found the pork chops to be over cooked. It seems brownies g them on top of 5 mins in the IP was just too much. Is there anything I could have done wrong? I only have 2 bone in pork chops on hand. Would cooking time be the same? Maybe cut the butter in half and only use half a package of ranch? Do you place the pork chops on the trivet or anything? Or just place them straight in the pan after browning? Can’t wait to try these tonight! I’m just curious how long it takes for the instant pot to pressurize for this. That is the one thing that I am having trouble with for all of these wonderful recipes! 10 minute total time isn’t accurate because it doesn’t account for the amount of time for the pot to pressurize. May I please ask that for future recipes that you try to include an estimated pressurizing time? As well as a pressure release time? That would help so much when trying to plan ahead! Thanks so much for all your wonderful recipes! I look forward to trying more of them! Hi – great recipe – thanks for sharing. However, I do not have an Instant pot – I have Power Pro XLT Electric Pressure Cooker. The one I have (the 10 quart) does not have a saute setting on it but it will brown while it is trying come to temperature with the lid off. I made a few changes/additions – cut the number of pork chops down to 2 as there only me that i cook for and that give me one for another dinner. I also cut the Butter to 2 tablespoons (why anyone is using margarine is beyond me!). To the dry ranch mix I have I added 1 tablespoon of Mrs. Dash original seasoning and 1 tablespoon of garlic powder. I also used Olive oil to brown the chops in as I hate coconut anything. Steamed vegetables and red potatoes on top of the chops. And since my chops were the super thick ones from Costco , I cooked them for 10 minutes and then I did a 10 minute nature release. Everything was fork tender and the sauce was delicious.. Again – thanks for a great recipe. How long if the pork chops are frozen or do they have to be thawed? I made this tonight and after eating it, I am compelled to come on and say thank you, it was amazing! It was my first time cooking pork chops in my instant pot and I am amazed at how tender they came out! I have one leftover and I can’t wait to have it for lunch tomorrow!!! Hey! So I tried this recipe and the chips turned out really tough. I’m not sure why. I didn’t brown the chops so they didn’t have extra cook time. I also added potatoes and since I added so many, I used a 1/2 cup more of broth than called for. I used the same ingredients and set it to 5 minutes. The only thing I did differently is let it go a couple minutes longer during the natural pressure release thing. Is that maybe why? Otherwise the flavor was freaking incredible! I think I’d use at least half a second pack of ranch mix, but man. This was delicious. This was delicious….. I used Lipton onion soup mix instead of ranch, 2 TBL spoon butter, 4 bone in pork chops, 14 minutes. Natural release. Thank you. I will try with Italian seasoning next time. Browning ahead of time was perfect. Meat just fell off the bone. Now have leftovers for another meal. I was wondering , what is the best coconut oil to use ? I’m new to using it , so i just wanted to know so i can us it for different things. If I wanted to add some potatoes, what kind would you recommend, and do I need to change the time? Also, would fresh veggies work? I’m new to IP! Slowly learning! This was delicious and loved by my kids and husband. I only used half a stick of butter and it provided plenty of flavor and sauce to pour over the meat. Going to make this tonight, but have two frozen chops. Do you think 10 minutes would be okay or should I do 9 since there are only two? And do I brown it first? I know it’d take longer since it’s frozen. Thank you! Super excited! Tried this with FROZEN solid pork chops tonight (6 chops) – 12 minutes….put frozen green beans on top. The beans were delicious (making them this way from now on)…..chops turned out great from frozen….may reduce to 10 minutes next time. Delicious dinner! Everyone loved it. Served with sweet potatoes. Since I had way too much sauce because of only having 3 chops, I am going to freeze the leftover in an ice cube tray and use to season veggies at other times. 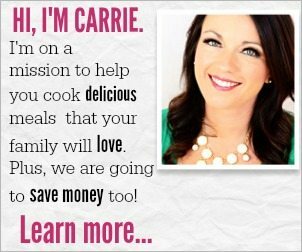 Super easy and great recipe…Thanks Carrie for helping me get started with using my InstaPot!! The flavor was magnificent! They were dry though =( Should I have done 5 min. on low? I made these tonight.. They were amazing. I used olive oil.. used salt, pepper, and seasoning salt on pork chops. I Loved the sauce but i used cornstarch and water to thicken it up a bit.. amazing!! Cant wait to share your recipe! Where are you supposed to put the carrots or potatoes underneath or on top of the meat? I love this recipe and it’s so easy to make it keto friendly. I use my favourite meat rub (Scarborough Fair from the Silk Road), and then saute the chops in buttery flavour coconut oil. Once browned, I add sugar free chicken broth and follow the directions as written. Chops are moist and flavourful amd go so nicely with roasted asparagus. Do you melt the butter beforehand? Made this tonight and loved it. Esp loved how quick and easy it was to do. Had all the ingredients already. And it tastes great. Thanks for sharing! ???? Love this recipe! My daughter and I made it together the first time. Today I made it to surprise her when she gets home. We added fresh cut green beans, red potatoes, an onion, green pepper, red pepper, and 2 cups of chicken broth. Turned out perfect both times. I used 1/2 stick of butter. More than enough. Chops were very tender. Wife is GF, so ranch dressing was a perfect choice. My loin chops came out a little tough. Delicious pork chops! We added sliced carrots. I have never liked cooked carrots until now. Amazing! Next time I’m trying fresh green beans. Love this recipe, very good and will make again! I usually put them on top. But either way works well. Generally in an instant pot, one cup of liquid is the minimum to bring it to pressure. So mine was really watery and didn’t have a ton of flavor. I added red potatoes as some people had mentioned. Is that why?? Can I use Ranch salad dressing instead of the powder mix? If so, how much? This recipe worked well for my family! There was a LOT of butter left over. I know you mentioned tossing in red potatoes. What about putting potatoes in a pot on top of the chops and using the excess butter “juice” to mash them? I’m a newbie so I’m not sure if that would work. If i cut the potato pieces small enough, would they cook ok in the suggested time? Thanks for your help and a yummy recipe! Our meal came out so good! I did it with baby carrots and red potatoes. Everything was so moist and soft. I tried it with a half stick of butter to save on calories and it worked well 🙂 I’m considering using a second packet of ranch to give more flavor because I used all those veggies as well. What do you think? With the one packet, we just added extra spices including Cajun! We love our spicy food lol Also, does the water have to be poured last on top of the pork and veggies, or can I put the water first at the bottom? I ask this because I feel like the seasonings would stick to the veggies better without “washing” it off. Wondering if this would flavor it even more. Or is there a reason you do the water last? TIA! MY family loves these. I’m lazy and don’t Brown the chops. Also I fill up my pot with potatoes then use the rack that came with my instantpot and put the pork chops on that. OMG this was super simple and absolutely FANTASTIC!!! I only had 3/4 stick of butter and used chicken broth instead of water. When the chops were done cooking I added in some potato starch to thicken and make a gravy. I served the chops with IP spinach and asparagus risotto. Next time I make this (and it will be soon) I think I’m gonna flavor the gravy like a piccatta sauce and add in some lemon juice and capers. So many possibilities with this simple recipe. I never knew pork chops could be so tender and tasty. Definitely a keeper!! Thanks for sharing. This is delicious! I added red potatoes and green beans with bacon (precooked and crumbled). Thanks! Sooooo i got my instapot for christmas and im in love. Tried this recipe with a couple variations…. First i substituted a mesquite marinade/ slow cooker seasoning package for the ranch and my chops were extra thick so i added 2 min to cooking time it came out perfect next time im going with some red pot. and a tomato basil season packet hopefully it’ll be just as delish. Thanks for the great recipe. Cooked as the recipe states. Added 2 minutes because my porkchops (fairly thin) were frozen when I started. When done, I took the pork chops out of the IP, then turned it on to Saute. I mixed a bit of flour into the liquid mixture to thicken it up. We then used that as a “gravy/coating” on the pork chops and some pasta. Delicious! Holy cow!! This wasso A-MAZING!!! After reading the comments, I also used chicken broth in place of water but only used 1/2cup. In addition, I added carrots and after the pressure released, I added corn starch and made a carrot gravy. So incredibly good and unbelievably easy. Thank you so much for posting and giving me another reason to love my IP!! ?? Have made this twice, once w/potatoes and the other w/out. Both times with bone in chops. The best,tender pork chops I have ever cooked. Need to be careful in removing as they can fall off of the bone. I prefer to cook w/out the potatoes as they were almost too done, cooked 8 min, could have been 6-7 min perhaps. *5 min cooking time the first time, natural release- perfect!!! Very good meal. I added carrots and onion and potatoes and frozen green beans. Next time I will only use 1/3 of a stick of butter though.